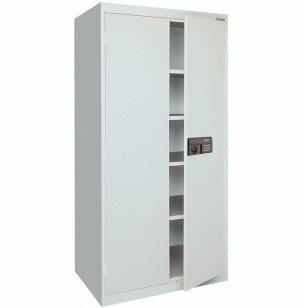 Sensitive records and valuable equipment get secure storage with these digitally locking steel storage cabinets. Storage cabinets with digital locks ensure that only authorized staff can access valuable items and sensitive documents. 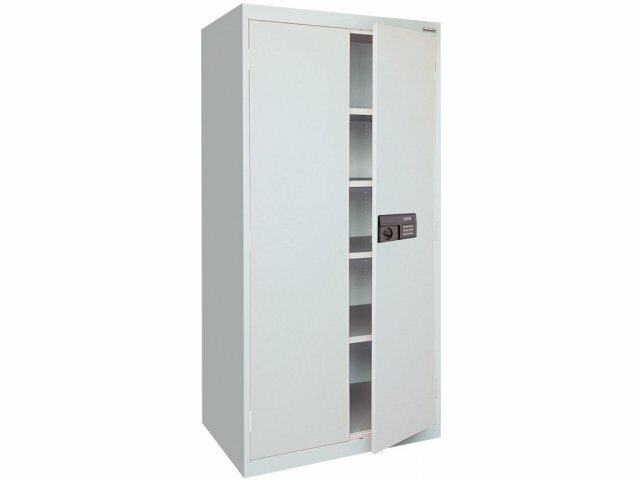 Sandusky's Steel Storage Cabinet with Keypad Lock protects contents on two levels. The digital keypad lock on this storage cabinet comes with two passwords: administrator and user, which can be changed to any combination of numbers (four user, six administrator). The keypad also keeps a record of the day, date and time that the cabinet was accessed, making it ideal for storage of valuable items. Emergency keys are included. All shelves are fully adjustable, and can be reversed to create a "tray" effect to hold items that roll or slide. Heavy-gauge, welded steel construction stands up to constant everyday use. Available in a choice of classic colors, this Steel Storage Cabinet with Keypad Lock is the perfect storage solution for businesses, school offices, medical clinics and anywhere else where strong, secure storage is a must. Sandusky Lee has been a major supplier of steel storage products for nearly 70 years. Steel bookcases, file cabinets, monitor carts, book trucks and teachers' desks are just some of their top-quality school and office storage solutions. Extra Strong: Heavy-gauge, welded-steel construction makes these storage cabinets super-strong and built to last. Adjustable Shelves: Includes four adjustable shelves in 2" increments, plus raised bottom shelf. Double-Level Security: Keypad lock has two passwords, for administrator and user. User Record: Keypad keeps track of the day, date and time when the cabinet was accessed. Backup Key: Emergency key included. Durable Finish: Powder-coat finish resists scratches and stains.